RiverBrook Construction provides a wide range of roofing materials and finishes to beautify and protect your home. We can accommodate the most complex roofing configurations, including hips, valleys, dormers, and modern pitch changes. We can install low rise and flat roofing products. We have roofing professionals able to handle older homes as well as the complicated modern roof configurations. Let our trained roofing estimators show you why RiverBrook Roofing can’t be beat!! Why Choose Riverbrook Construction for your Roofing? We are an Owens Corning Roofing Preferred Contractor. The Owens Corning Duration Shingle offers multiple roofing color options. 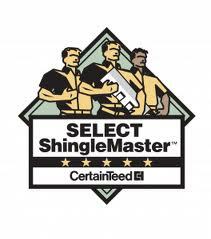 RiverBrook construction is very proud to be a certified Shingle Select company with Master Shingle Applicators for CertainTeed's Integrity Roofing System. The CertainTeed LandMark architectural shingle being our number one seller! !